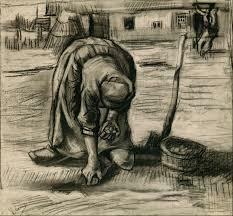 Vincent Van Gogh's Peasant Woman Planting Potatoes reflects the hope Oleander finds in planting his own potatoes, even if late. "Kept you too busy to dig a little earth, huh?" she challenged me. "You're missing our usual gardening rivalry," I told her. But I was, too, so I grabbed a shovel and went out to my garden patch. Folks, I've seen Mabel's garden. The onion sets she planted last month are stiffening into fine scallions. The seed potatoes have grown their eyes, have broken through the earth, aiming to see the world. The first slips of lettuce have twice told the weather that their green is heartier than snow. Her beets grow on, the undersides of mottled leaves turning purple with veins. Not to be outdone, I slipped my shovel into the loose earth of my garden. When I sliced through my first earthworm of the season, I knew I'd just created two earthworms. An unearthed scrap of paper reminded me of last year: Burpee, Swiss Chard. Soon, the damp earth brought good news to my nose: humidity and humus. The birds cheered my ears. Hands that have only dug a grave for a cat got busy breaking clods, sorting seeds, poking, then patting, the soil. After a day outdoors, I hardly cared about anything but the earth. Seeds and birds, breeze and sky, sun and rain are the same for us all, they are democratic with a little "d," growing whatever seed happens along in the wind. So now that I've planted, I'll have to keep the weeds out. I'll devote myself to my garden instead of worrying about my relatives, and my age, and my so-called “condition”—meaning worried I have one because I get tired. Next time Mabel Beemer comes by and asks, "Well, William, what have you been up to?" I'll answer, "Gardening. Come back here and see my new hybrid red chard." Yep, with Spring hopes eternal, hope springs eternal--flashing bulbs, bird calls ("What cheer, what cheer, what cheer"), argumentative squirrels, ants dropping in for dinner. I'll garden like Voltaire's Candide, who, upon experiencing the world, gave up travel and worries, saying, like Mabel Beemer: "We must cultivate our gardens." We might be weathering some chilly temperatures now, but High Plains gardeners know that it's not too soon to think about spring planting. Today's Growing on the High Plains gives a shout-out to one of my favorite "firsts" among springtime flower beds: the pansy. These bright blooms look anything but shy, and they're available in a variety of shades and fragrances. I'll offer some hot tips for these cool-weather friends, as well their love-laced legend.